~ by mrpatrickblog on April 14, 2011. Yeah, I love that spot. You got an amazing picture of the view. Lots of times when I go down there, you’ll see photographers at the water edge with huge cameras on tripods. They wait there for the sunset. You picked a perfect time! 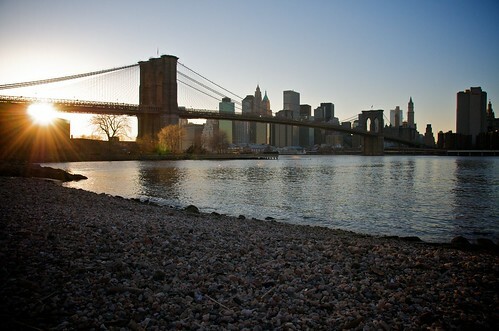 I like Brooklyn Bridge Beach Beauty,It’s so amazing! Great Shot! I like how the sun is peeking over the building, almost yawning in a sense; to what looks like the making of a beautiful brand new day. Phenomenal shot Bryan! wow! it’s pretty awesome to belive it! It’s like a film start!